Well, that’s all the scarves. This is actually the one that first brought Darlene’s work to my attention, because it happens, by sheer coincidence, strongly resemble a painting I made when I was 18 years old. The painting was 1.5 feet wide by about, oh, 8 feet long. The idea was a slice of sky, starting from the sunset west, arcing up across the zenith, and all the way back over to the moonrise east. As a result, you could view it two ways: sunset at the bottom (putting moonrise upside down on the top), or moon at the bottom (with upside-down trees and lake with sunset then on the top). I was never a particularly good artist, but I have a good graphic sense, and the painting worked pretty well, being simple of execution. Plus: hey, cool idea! I used to flip it around according to the season. Fortunately, my parents’ house had an open stairway in the foyer, with a tall wall perfect for the painting. 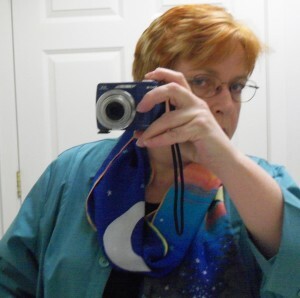 And that’s what I saw with Darlene’s scarf, a sort of shock of recognition. The painting could only hang in one place — but if I bought that scarf, I’d have the image with me whenever I wanted it! 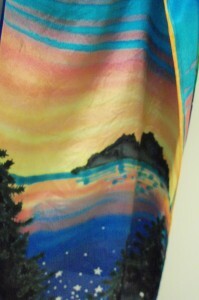 The date on this scarf is blurred, so I don’t even know when she made it, or for that matter, when I bought it. A while ago. But this is the one that I first noticed. And I definitely AM inspired by being able to have these images with me when things get rough. And have them be as beautiful as the versions in my mind. It's like she reads my mind and puts it on a scarf! You should look for Darlene in the dealer’s room at Science Fiction and Fantasy conventions. Best place to see her work; her website doesn’t quite capture the drama. Oh, and she has paintings, too! Comments Off on Returning to the Horizon Line	| tags: darlene coltrain, Darlene P. Coltrain, scarves by Darlene, wonder if I can get that painting up on a wall again?